The Ruggedised Tag is suitable for harsh environments and where a Tag needs to be mounted onto large metal (trucks, roll cages etc) or wooden objects (pallets, kegs, crates etc). Protected against vibration and shock (1.0 GRMS 150 cm/sec). IP54. Other ingress protection and shock specifications to order. Optional waterproof connector allowing access to user and tamper alerts and 4 additional inputs (for switches, relays etc). Sensor Tags allow temperature, humidity, light, pressure, flow or gasses to be monitored. e.g. Temperature Sensor. -20C to +85C, +/- 0.4C accuracy, surface, air or immersion. Available with and without movement detection (always-on for items that require detection when not moving). Optional switch-based or magnetic detection Asset Alert (triggers Tamper Alert if Tag removed from asset). Flange-mounted (rivet, screw, magnetic, high bond tape options). 67mm x 35mm x 20mm (L x W x H) including flange. 35g. 4-5 year lifetime. With access to alert and general purpose inputs 67mm x 50mm x 20mm (L x W x H) including flange. 80g. A 6V-24V DC (external power supply via flying lead) always-on version for vehicles is available. 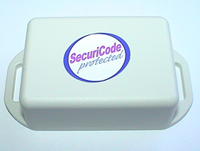 Also available as LongRange Tag (80metres indoors / 250metres outdoors).